This perforator and side-scraper was found sometime in the late 1970's by Pete Bostrom while surface collecting on the Bostrom Clovis camp site. 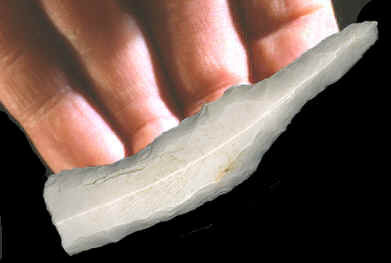 It is a good example of a stone tool that was made with core and blade technology. This combination perforator and side-scraper was made from a thick core blade that was struck off a prepared core. Two previous blade removals can be seen on the surface. Step fracturing on the edges indicates that this tool was probably used as a side-scraper. 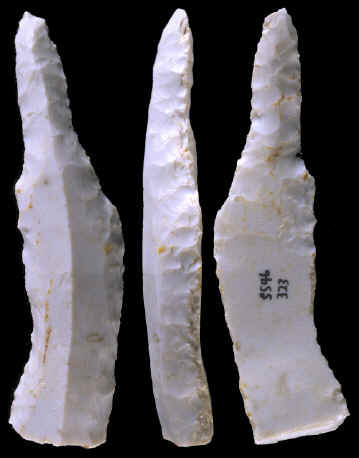 The long narrow tri-facially flaked point may also have been used for perforating soft materials, such as wood or animal hide. This perforator and side-scraper is made of Burlington chert and measures 2 5/8 inches (6.6 cm) long. The above picture shows three views of a unique Clovis tool that was made from a core blade. Notice the edge wear and the three sided pressure flaking that formed the long narrow point. This tool was made from a thick blade that was struck from a prepared core. Also notice the two previous core blade removal scars. Those blades were struck off the core before this blade was removed. Manufacturing stone tools with core and blade technology is a signature of the Clovis culture.